Nokia says it will replace for free millions of faulty cellphone chargers that pose a shock hazard to its users. 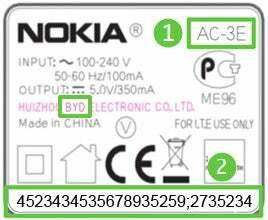 Nokia announced the recall program Monday, reporting the Nokia-branded chargers were manufactured by a third-party supplier, BYD Electronic Company of China. Nokia says the plastic casing surrounding the chargers in question could separate, exposing the unit's internal components, creatinging a shock hazard. The fault was discovered during a routine quality inspection, and Nokia says it knows of no incidents where a user has been injured by this flaw. The recall affects users in the United States, Canada, and other countries around the world. Three separate chargers are affected by today's announcement. 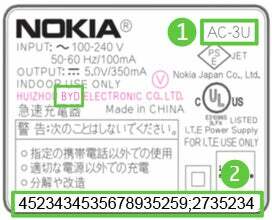 Those being recalled are Nokia's chargers with model numbers AC-3E and AC-3U manufactured between June 15, 2009 and August 9, 2009, as well as Model number AC-4U manufactured between April 13, 2009 and October 25, 2009. To see if your unit is affected, refer to the label where your charger's voltage and manufacturing information is printed, as pictured in this post. (Click on image to the right to enlarge) From the label, you should be able to determine your model number and the name of the manufacturer. If your charger is affected, you will also need to know the charger's identification number--the long string of numbers--identified as item number 2 in the pictures. To return your charger unit, go to Nokia's dedicated charger exchange Website, and enter your charger's model and identification numbers. The Website will then lead you through the steps required to exchange your charger. If you're unsure if your charger unit is affected, you can also check your model using the exchange site. If your charger is part of the recall, Nokia recommends that you stop using the charger altogether. You can also get an exchange by calling Nokia directly at 1-888-Nokia2U. This is the second major product quality issue for Nokia in recent years related to a third-party supplier. (Click on image to the left to enlarge) In 2007, Nokia issued an advisory for potentially faulty batteries made by Matsushita Battery Industrial Co. Ltd. The advisory was issued after it was discovered there was a small possibility these batteries could overheat. The company offered to replace as many as 46 million batteries for concerned customers, but did not issue a formal recall. In its initial announcement on Monday, Nokia did not say how many chargers were affected, but London's Times newspaper is reporting the number could include as many as 14 million phone chargers.